Touch. The World at Your Fingertips Touch. The World at Your Fingertips The ASUS VivoBook S550 gets even more hands on, thanks to a responsive 15.6” HD touchscreen that lets you tap, swipe and pinch to zoom just like a tablet. Designed with users in mind, the VivoBook offers an incredible mobile computing experience with a stylish and easy-to-carry slim design. 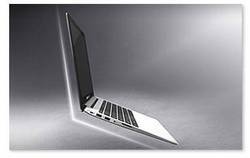 ASUS VivoBook S550 and You. Incredible Together. Move over, keyboard and mouse. 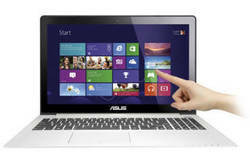 ASUS VivoBook S550 Series unleashes the power of Windows 8 with an all-glass 15.6” HD capacitive touch panel. Open up a world of functionality with a notebook that lets you double tap to open documents, swipe to browse photos, and pinch to zoom in on maps, just like you would with a smartphone or tablet. Of course, if you prefer your trusty keyboard and track pad, you’re free to use those methods as well. A notebook with a touchscreen is incredible in and of itself. Of course, a slim Ultrabook profile with premium brushed metallic texture, hidden hinges design, and a Chiclet keyboard wouldn’t hurt either. Focusing on even the smallest details, the ASUS VivoBook S550 is set to offer high durability and an elegant look within an ultra-slim profile that matches the dynamic new standards for high-portability and intuitive computing. Featuring exclusive ASUS SonicMaster technology, the ASUS VivoBook S550 Series delivers deeper and richer bass, a wider audio range and pristine clarity through its built –in speakers to provide the best audio experience of its class. 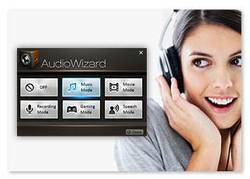 With proprietary software ASUS AudioWizard , it also offers access to new dimensions of sound, with selectable modes fitting your needs based on your environment and preferences to ensure multi-faceted and living music, movie, and even game sound. One…two… and we’re back on. 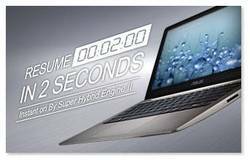 Get up to speed faster with exclusive Super Hybrid Engine II—delivering two-second instant on so you can resume from hibernate mode without delay. Data is also safe and secure with the ASUS VivoBook S550 Series which automatically backs up your data when battery level drops below 5%. Grab it from the cloud. With cloud-based ASUS WebStorage, access all your documents, photos, music, and videos from any device you are on. Even better, ASUS VivoBook S550 comes with free 32GB of WebStorage cloud space for three years (valued at $49.99). Relax, ASUS has got you covered! Dimension 15.1" x 10.2" x .8" 15.0" x 10.5" x .8"